A picture is worth a thousand words, and that’s especially true when it comes to beautiful dentistry! Our Smile Gallery is filled with real smiles and real stories from real people Dr. DeAngelo and our team have been able to help throughout the years. As you’ll see, just one or two simple procedures, when performed by an expert, can make a tremendous difference in how a smile looks. Explore the different cases featured below to learn more about what you can expect from our Homer Glen practice. A beautiful smile does more than simply look good--it can build your self-esteem. Anna was a spa owner who, while she made other people look their best, felt that she could do more for herself. 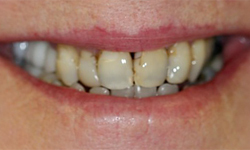 When she consulted Dr. DeAngelo about how she could change her smile, she was pleasantly surprised. Having severely worn and chipped her teeth throughout the years, Anna learned that Dr. DeAngelo could both lengthen the appearance of her teeth and whiten them as well. The results, as you can see, were a wonderful transformation. After seeing numerous dentists before Dr. DeAngelo, Bev told him that he was the only dentist that asked her if she liked her smile. 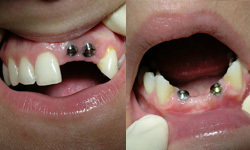 For years, she was dissatisfied but thought that the only thing she could do was use conventional braces, and that would take years. After discussing treatment options, Bev and Dr. DeAngelo decided on a combination of procedures including all porcelain crowns. In a matter of weeks (instead of years), Bev had beautiful results. While she already had a dynamic personality, the confidence she gained from having an incredible smile was a great boost. A single tooth can mean all the difference in the world for some people. 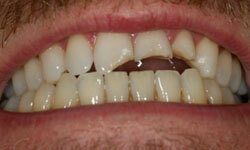 A chipped or cracked tooth can easily be repaired in a long-lasting manner. Here, a single veneer made a vast improvement for Dennis. Note that the color match was superb. Donna had previously seen a dentist who had given her crowns. 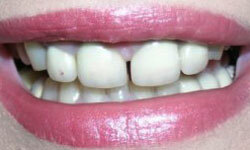 They were thick, bulbous, discolored, and did not address the gap between her two front teeth that Donna never liked. After consulting with Dr. DeAngelo, he said he could help. How did it go? Besides the great appearance of the after photograph, please read the wonderful letter that Donna wrote to us that’s available in our website's review section. Thank you, Donna, not only for the kind words but for letting us help change your life. 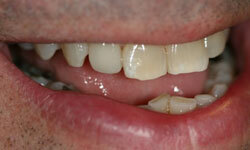 Cosmetic bonding may be just the thing to repair cavities that have formed between a person's front teeth. 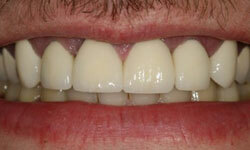 These fillings are done in one appointment and provide a great result. 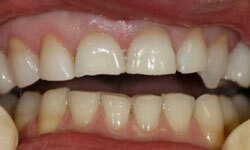 Bondings or fillings can be made to match your natural teeth very accurately. Look closely… can you spot the fillings? Trying to do the right thing, Maria planned to have a cab drive her and her friends to and from her sister's bachelorette party. Unfortunately, the cab got into an accident with another cab and Maria lost several teeth and her youthful smile. She was devastated! 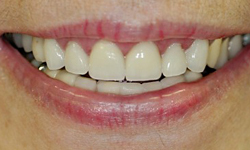 After her surgery to remove the fragmented teeth and place dental implants, a temporary partial denture known as a “flipper” was placed to restore her smile and hide the metallic healing caps seen in the before picture. 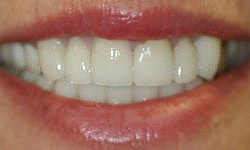 The final restoration placed by Dr. DeAngelo consisted of porcelain crowns linked together to form a bridge on both arches. A truly beautifully end result gave Maria back her smile, her confidence, and her sense of wellbeing. 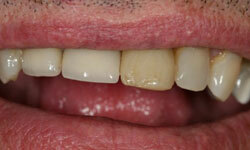 Sometimes, cosmetic dentistry is not about enhancing what is there, but about restoring what was lost. The phrase, “The art of dentistry,” is often used. 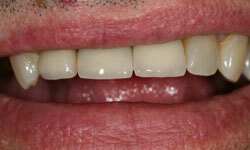 It is vitally important for the dentist to have a good eye for color matching and shading in an example like this. 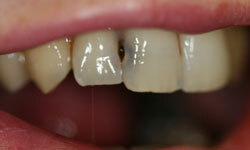 Color matching a single tooth can be one of the hardest things to do. 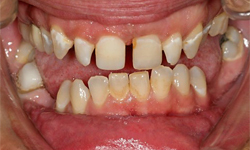 As you can see in the before picture, the appearance of a single tooth can often be the deciding factor in having a great smile. 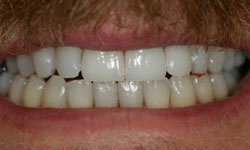 Dr. DeAngelo restored Tom's smile by replacing a crown originally done by a previous dentist. One night, in a case of motorcycle meets deer, it was more than the motorcycle that got banged up. 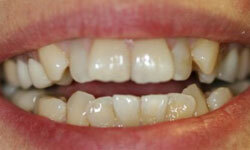 Porcelain veneers restored this great smile back to its original form. “I want to eat ribs again,” was Todd's complaint. 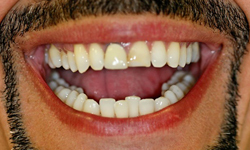 In an unusual situation, due to a combination of factors, Todd's bite had collapsed and his lower front teeth were wearing his upper ones thin. They were see-through! To make enough room to restore his teeth, we needed an orthodontist to intervene and open his bite. After that, we made porcelain crowns that had a metal backing and substructure to absorb the forces on his teeth. 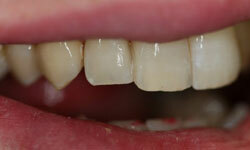 The metal substructure, usually used for back teeth, allowed us to make the backs of the crowns very thin. 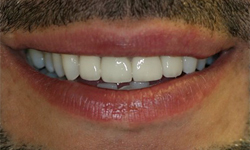 It also, however, made it harder to achieve the lifelike translucency of our all-porcelain restorations, but the transformation is still outstanding. After treatment, Todd told us that he was eating ribs again with confidence, not in fear of breaking his teeth. He also told us that his students at school noticed his new smile and told him that they were extremely happy for him. Looking good, feeling good, eating ribs? What more can one ask for? 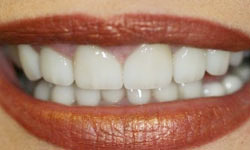 After a general examination and thorough discussion, Dr. DeAngelo found that Kathy did not like her teeth’s appearance. She was worried, however, that if she had any cosmetic work done, she would lose her look. She said she had seen other dentists’ cosmetic work and it looked too phony, too big, or too bright. She did not want to lose her individuality. Always having longer, narrower teeth, she wanted to keep those proportions. In other words, she wanted to still look like herself, only better! As you can see, Dr. DeAngelo met Kathy's expectations, and the results are beautiful. Sam's previous dentist did two things that Sam did not like. He gave Sam a black line at the base of his front tooth and also made an oversized crown. 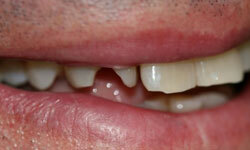 Sam's other central incisor was cracked as well but not restored. His lateral incisors were narrow and tipped. Sam wanted not only his old smile back, but an improved one. In order to get the length and spacing perfect, Dr. DeAngelo spoke to Sam about doing a combination of both crowns and veneers. The end result looks great, and Sam was thrilled with his new smile. 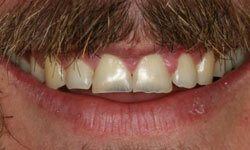 He is planning on restoring his lower teeth, which are out of alignment, next. 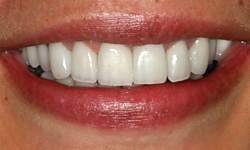 Traci did not like her smile, and as you look at the before pictures, you can understand why. During her youth, Traci never received the care and attention that her condition demanded. Her case was mishandled by well-meaning dentists that just did not know what to do. As a matter of fact, when Traci decided to finally do something about her teeth, she consulted with nine other dentists before coming to see Dr. DeAngelo. 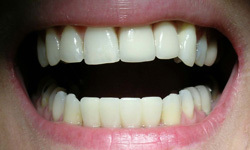 Each of the previous dentists suggested that she remove all of her teeth and have dentures made. The trouble is that dentures would not have solved her problems, and, at the ripe old age of 26, she was nowhere near ready to wear full dentures. She continued her quest to find the solution to her problem, and she found Dr. DeAngelo. As an aside, when the surgeon who performed a procedure connected to Traci’s treatment with Dr. DeAngelo presented her case to a group of 80-90 of his colleagues, not one other dentist had proposed any treatment other than full dentures. Not one!